Sometimes turning the conventional wisdom on its head helps ensure a better hunt. 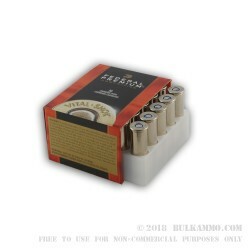 With Federal Premium’s 300 grain CastCore .44 Remington Magnum loads, forget about expansion and wound channel size. Instead focus on a bone crushing, hide penetrating hard cast projectile that is meant to maintain weight and stopping power upon impact. The jacketless casted bullet is designed specifically not to expand, but instead to retain all the physical properties it has in the virgin loadout. This concept makes it very effective for super tough animals that have hard skin, big bones and lots of fat or muscle surrounding vital organs, including hogs. The heavy weight 300 grain bullet is just about perfect for the wooded, heavy brush areas of the hog’s habitat. The hard cast bullet design can crush bone and offer penetration to create a massive impact on target and drop these animals that are notoriously tough beasts, right where they stand. Remember this is not a simple handload from a guy in his garage either, this is Federal Premium, and they have brought the full weight of their R&D team and the ballistics knowledge they have collectively, to vet out the potential of this round. It’s a solidly made, high quality round with a reloadable brass casing and a legitimate hog stopping projectile. Don’t hesitate to use it on other larger game as well – where suited by regulation and by choice.